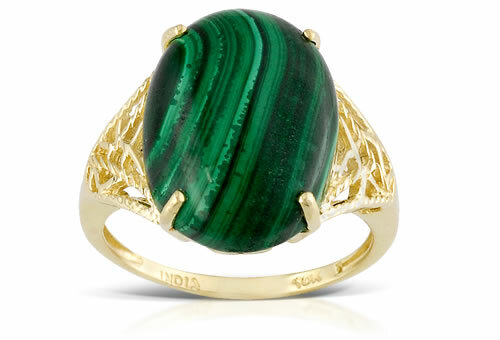 Malachite is generally opaque and comes in a vivid bluish green to green color. It is usually banded in two or more tones of green and may have a subtle sheen. This gem is a secondary copper mineral and is commonly found in conjunction with azurite, a bold blue copper carbonate mineral. A mix of the two minerals is often called azurmalachite. Malachite is often seen with botryoidal growth, curved or angular banding alternating between lighter and darker shades of green. Stones may have fibrous structure and sheen. Stones might show scratches and dull polish due to low mohs hardness.